For investors preparing for retirement, it may be more difficult to distribute income in retirement than to accumulate. When you consider the shift from guaranteed income via pensions to defined contribution plans, and also include trends in caregiving and debt, generating sustainable income in retirement is a serious challenge. Automated savings programs, tax-efficient planning, and balanced investment strategies provide a basis to help investors plan for their retirement date. But, they also need to plan for multiple challenges on the other side, such as how to spend down assets in retirement wisely. Investors must consider how to manage issues of longevity, inflation, and health-care costs in retirement, and when to claim Social Security. They also need to decide if they will continue to work, when they should begin to withdraw retirement savings, and how much. Additionally, a growing number of adults have caregiving responsibilities for aging parents in addition to providing financial support for adult children. Some 10 million adults age 50 and older comprise this so-called “sandwich generation.” In the past year alone, 60% of parents provided financial assistance for their adult children. Debt poses another challenge. A 2015 study found that homeowners over the age of 60 were three times more likely to have a mortgage than they were in 1980. Student loan debt set a new record in 2019, topping $1.4 trillion. Another troubling trend has emerged. The Federal Reserve reported in 2018 that individuals age 50 and older held more than $260 billion in student debt, up from $36 billion in 2004. In addition, nearly 40% of borrowers age 65 and older were in default. (Consumer Financial Protection Bureau). Only half of adults have a long-term financial plan. Yet, numerous studies have found that professional advice and a comprehensive plan may help savers meet their retirement goals. As retirement planning grows increasingly complex, more investors may seek expert advice. 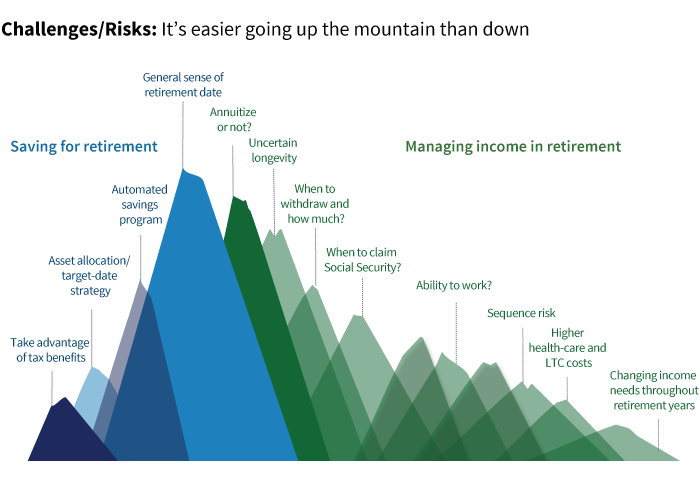 With many unknowns— health, expenses, and benefits — investors will likely need to plan for managing changing income needs throughout retirement. * Your name and email address are required. Putnam will not share your email address. Get Retirement/Income resources to help you engage clients in meaningful conversations that can lead to useful solutions for them and business-building opportunities for you.